What is a good size for a small hobby blacksmith shop building? When researching the question, the rule is seems to be bigger is always better, gives you room to grow. There is always the mention of the outside smithy under a tree (Longfellow), get an aircraft hanger, to several sizes in between. The following examples are small shops I have visited. The blacksmith that worked under a tree was happy. He had a metal table, forge, anvil, and vise. He said he made an open sided tin roof just to keep the sun and rain off him. He preferred to work outside, as he wanted to see the weather and the change of the seasons as he worked. Others have used a shed roof attached to a building, open to the air and elements. A well known and respected blacksmith had an 8 x 10 foot storage shed as a blacksmith shop. He out grew the space and set up a peaked roof pipe frame, and covered it with a tarpaulin for a roof. The sides were open to the air and elements. Under the shelter was his solid fuel forge, work table, anvil, and vise. Tools and anvil were put inside each evening and the doors to the shed were closed and locked. There are other blacksmiths that have taken over a section of a building, or a barn when starting out or when more space was needed. Let us keep this on the level of a hobby blacksmith for now. A roof is not needed but convenient, depending on the weather. Walls are optional. We need to discuss the size or footprint, of the work area. For reference a pallet is 3.5 x 4 feet (14 sq ft), and a sheet of plywood is 4 x 8 (32 sq ft). For convenience, several size options, that we should be able to relate to, are listed and numbered. We have gone from a 80 sq ft storage shed to a 576 sq ft 2 car garage, or 7.25 times the footprint. What size was your first shop? Were there any problems with that size? 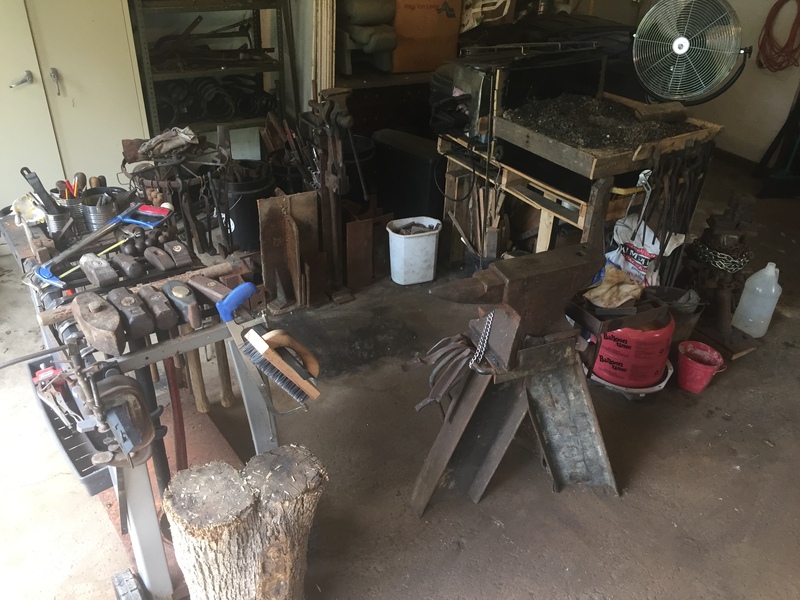 What would you now recommend as good size for a small hobby blacksmith shop? My forge is 6 x 8 foot, a steel sheet clad aluminium framed ex green house. It is devided down the midle by a walking/working area. forge and beloows one side and anvil opposite. There is virtually no storage space any fuel stored is moved outside while working. Tools and stock are for the most part stored elsewhere. Even the quench tank resides outside the door. Also outside I have a logstore come bench with a woodworking vice. It is situated close to a brick outhouse and a tarp roof could be errected to span the area twixt it and the forge. The only real problem is the limited size although I can utilise the adjoining areas, temporarily remove panels to permit longer stock to be heated or move equipment outside, it takes time prior to and after a session. There really was no other option in a small suburban garden. It's a matter of making the most of the space available and being flexible. One of the advantages of having the forge set in the building is no set up and take down time as would be the case with temporary setups. It is good to go on arrival and on leaving any remnants of charcoal can safely be left to burn down unatended. my first was 10x10 with no walls, dirt floor. my second was 16x14 with 3 walls, gravel floor. my third and current one is 25x45 with 4 walls, concrete floor, and insulation. Neither of my first shops were at all bad for the amount of equipment i had at the time, but as your skills grow, your tooling grows, and it sure is nice to have more space. as a general rule, i think bigger is better. i have never heard of anyone complaining of too much shop space. I started out with an 8'x8' storage building I did my cold work in. I had a little corner just for that leaving the rest full of other stuff. Hot work was done outside in a roughly 10'x10' area walls see a do kennel with tarps on the (I'm not a fan of people staring at me while I work). I had a dirt floor and loved it. If I needed power I had an extension cord I'd drag out. I ended up adding an 8'x12' addition to the building and cleared all the stuff out of it and used it for my shop. I had plywood floors and electricity in this setup. Cabinets from an old house on three walls and two custom workbenches. I moved to the very back outside corner of my property after clearing the wild growth that was here when I bought the place several years ago. I tore down the old shop and my current one is 12'x12' with pea gravel floor. I have a 10' garage door on one wall and windows on two other walls all of which can be opened for ventilation or whatever other reason I need. Again, I have electricity ran to this one. I don't have nearly the cabinets in this one as the last as I found I don't use them enough to have them take up so much space. I have debated on expanding but for now I'm relatively comfortable in my space. My one and only smithy is 10 feet by 30, 300 sq feet. The floor is dirt formerly a rabbit barn with crushed lime stone in front of the forge, anvils and vise. It is attached to our garage which is 30X30 feet and has power equipment in it, bench grinders, 2X36 inch belt grinder, 2 belt sanders small metal lathe, wood lathe, drill press, 3 kilns, work bench with machinist vise. We use about half the space for my coal forge, power hammer, two anvils, post vise, post drill and air compressor. The rest is taken up with stuff that I don't want to get wet. I'm slowly moving stuff out to expand (never have enough space). We recently added a 10X10 crushed lime stone pad outside the door for our propane forge with a post vise and improvised anvil, no roof or walls. My first two smithies were outdoors: first in the back yard of my parents’ house in Philadelphia, and then essentially in the middle of a field in Vermont (winter smithing was fun). My current hobby operation occupies a roughly 8’ square section of a two-car garage, which is plenty for what I’m doing. I will occasionally use the rest of the garage for laying out a larger project or as somewhere to put workpieces that need to air cool. I have 3 spaces and a couple of portable kits. Close to home, under the carport I do my dirt box experiments. In Dads shop I have the 120# anvil, and a wood fired v bottom forge. I move it out into the main bay next to the welding bay. Then I have the truck, and as the forge is attached I consider the bed a space. It has all my carrier related forge equipment. The portable kits consist of 4 "anvils" some cheep ball peins from harber freight and a portable side blast with a hand bed pump. 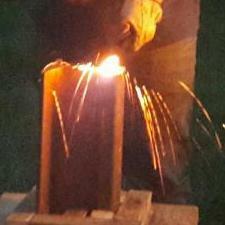 I also have a hand cranked rivit forge, so I can have a more conventional demo. I will be adding a portible tredle to my demo kit. Already have a 14x8 trailer with my leather and sowing shop as well as a 8x20 with my wood shop. 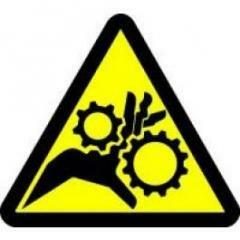 But my blacksmithing ends up as an Adhawk affair. I may start a thread concerning desighn ideas for the shop trailer. Walls? Walls are very necessary in locations where strong winds are common---or security is an issue. Even with a decaying detached garage in the inner city of Columbus Ohio I kept anything removable down in my basement and carried it out for use. Out here in New Mexico 40 mph winds are pretty common some times of the year and NA gas forges won't work without walls. There is no such thing as *a* hobby forge. 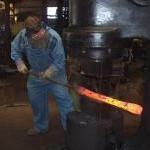 There are a large number of types of hobby forges. If you make keyrings and bottle openers a tiny space will work for your hobby forge. If you make gates for a hobby and need to swing a 10' length of stock around the shop then 20' wide/long is a minimum! I've forged in spaces as small as 6'x6' and as large as what was formerly a RR shop. Both were well suited for what I was doing in that location. Forged standing on a piece of plywood sitting on several inches of snow or sitting in a chair in the basement (basement was much more comfortable but limited the size of items I could work on...) When doing demo's I used a 10'x20' canvas tarp and divided that in two with a 10'x10' work area and the other one was for tools, storage, friends, chairs, cooler, etc. My first forge was half of a 6x4 shed, with my forge just outside the door meant I could work small pieces and muffled some of the noise for my neighbours. Now I am in a 20x10 workshop, with a good solid concrete floor to bolt my vice to. It has made such a difference as now I can work no matter the weather. Are you separating storage from shop space? IMO, you need a heck of a lot more space for general storage than you need for the actual shop work--and can use that storage for the rarely used shop equipment if it's set up right. So...my vote is that storage is at least as important as work space. Metaphorically, I could happily live in one of those "tiny houses"...if I had a separate place to store the stuff I need *sometimes*. Does that mean my house is effectively larger or does that space count separately? The one size issue that had bitten me with a small (or poorly designed) shop space is the dangling end of long bars (or boards in a wood shop). You need somewhere for those to go. For the sake of example only, I'll use the notion of ripping an 8' long board on a table saw: That means you need at least 16 feet of clear space somewhere to make it happen. Something similar happens even worse when working with metal in a horizontal bender---you need 8 to 10 feet in at least a 90 degree arc (usually more than that) just to be able to swing the tail of the bends you might put in a longer bar. Point is, the shop space can be micro but actual work space needs to be available beyond that--unless you limit the nature of your work quite a bit and store little in terms of material or lesser used equipment. Well, I'm just starting and still on my first shop which is a whopping 33 square feet. I sectioned off part of a 8x16 shed and made it as sound proof as i could since most of my forging time is late at night. My coal forge, anvil and post vise all fit within this space. remove another frustration in your life...you don't need no more anxiety.......start with a 100' x 200' cavern inside a stone mountain and go fer it !!!!! And after you fill the first one? The size for a Blacksmith Shop is exactly the same as the size of a Sail Boat, 2 feet too small/short. Every Sailor knows "2Footitis"!! !